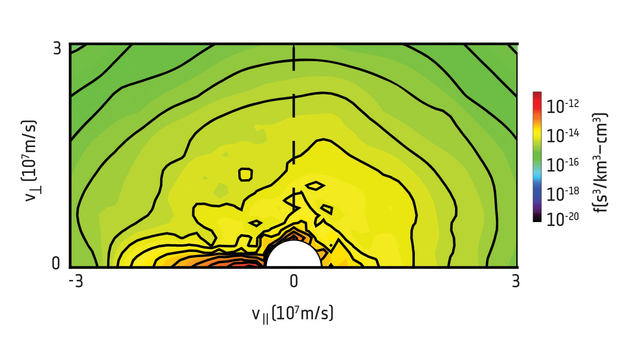 The distribution function of electrons in Earth magnetosphere as measured by one of the four spacecraft of ESA's Cluster mission on 26 February 2001. The measurements were obtained in storm-like circumstances, under enhanced auroral conditions. The horizontal and vertical axes indicate respectively the electron velocities parallel and perpendicular to the Earth's magnetic field; the colour scale indicates the phase space density of electrons. This and other Cluster measurements demonstrated how the distribution of electrons changes over time, because observations were taken over an interval of time similar to the oscillation period of the waves. Combining these Cluster data with observations performed by NASA's Van Allen Probes during a geomagnetic storm on 1 June 2013, scientists have revealed how electrons interact with a class of standing Alfvén waves, known as Kinetic-Scale Field Line Resonances (KFLRs), that are enhanced during geomagnetic storms. 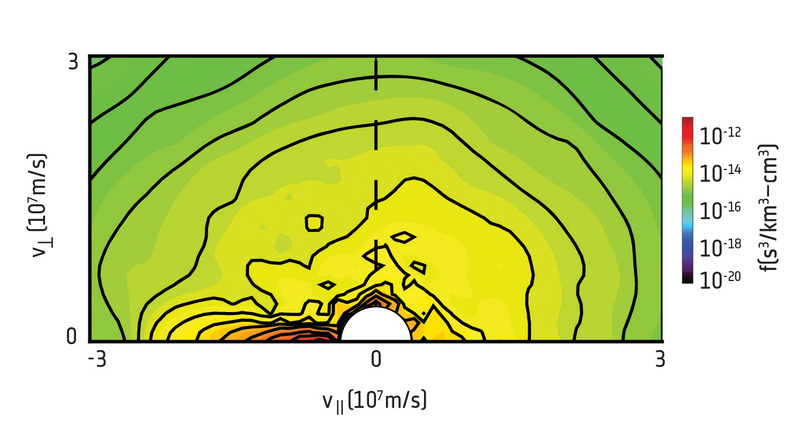 The observations indicated that the distribution of electrons is stretched – note the concentration of contour lines elongated along the horizontal axis at the base of figure) in the direction of Earth's magnetic field, and by comparing the data with computer simulations, it became clear that the stretching was caused by the trapping of electrons within the standing waves.